Habitat Group, a Thailand-based property developer, has signed an agreement with Wyndham Hotels & Resorts to manage and operate a property under the Ramada by Wyndham brand in Pattaya, Thailand. 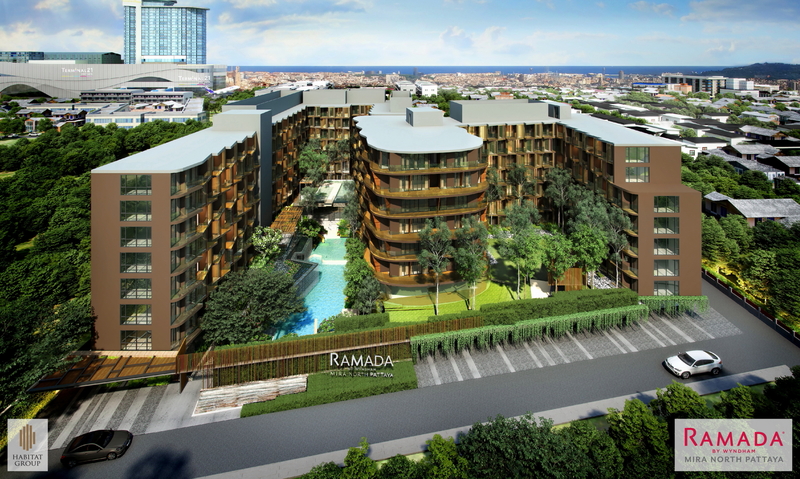 Located on 3-rai of land in the north of Pattaya just 1.4km from Wong Amat Beach and 500m from Terminal 21 Pattaya, Ramada by Wyndham Mira North Pattaya is an eight-storey condominium consisting of two buildings and 339 fully furnished units. Three room types include Deluxe Rooms, which represent 92% of the total (314 units) and are sized 29 sq.m. ; Junior Suites, which are 42 sq.m. in size and comprise 6% (19 units) of the total; and Suites, which total only six units and are the largest at 55 sq.m. Prices start at 3.9 million baht at an average 140,000THB per sq.m. Habitat Group is offering a 30-year investment with a guaranteed rental return of 6% for three years and profit split – owner (70%) and operator (30%) – for the remainder. Owners will also receive 14 days of free stay per year. Terms apply. See latest HD Video Interviews, Podcasts and other news regarding: Wyndham, Ramada, Pattaya.